This is an ANONYMOUS survey. 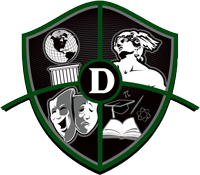 The D'Evelyn Accountability Committee seeks feedback from all students to help assess how D'Evelyn is performing. The results of this survey will be used to help identify what is working well and what requires improvement. As such, your honest feedback is very much appreciated. Please ensure that you complete every question or you will be unable to submit your survey at the end. * 3. Which of the following best describes your plans for next year? If leaving D'Evelyn, please tell us where you are going and why you decided to leave. * 4. I get the academic support from school resources when needed. If yes, select which resource(s) you use. If you do not use any of the above support options, please explain why. * 6. Teachers explain the purpose of homework assignments and why the work is important for my learning. * 7. I find the homework assignments to be purposeful and relevant for the course. * 8. On average I spend approximately how many minutes per day, including time spent in 7th hour, on my homework for this class. * 9. What is the total amount of time per day on average you spend on homework, including time spent in 7th hour? * 10. The specific feedback my teacher provides on my homework, essays and tests improves my understanding of the course content. * 11. I use my teacher's web page to obtain information, on assignments or access other resources. * 12. Sufficient advance notice of assignments and tests is given allowing me to plan my time effectively. * 13. Assessments (tests/quizzes) fairly reflect what I've learned from the assigned reading material and class lectures. * 14. I have had three or more major tests or projects due on the same day. * 15. Different instructors of the same course teach the same content and grade consistently. Please explain why you answered this way. * 16. Grades on assignments and tests are posted in a timely manner. Please describe any academic dishonesty you have witnessed. * 18. My teacher's communications and actions are kind and respectful to me as a student. * 19. My teacher cares about my success as a student. * 20. I am comfortable seeking support from my teachers and the following D'Evelyn staff. * 21. My teacher is approachable and has earned my respect.